- Perform the task to keep the navigation. - Calculate the stability of the ship. - Handling of cargo,lashing and verification. - Deck maintenance,hull,pollution prevention equipment. - Waste disposal, monitoring the reefer temperature on ship during load or voyage or demolition. - Administration, supervision, safe operation and economical on deck department, maintenance and care all room and supplies under the responsibility. - Organizing daily book deck, rudd move book, port log, sounding book with books note related with activities on deck department. - Check and keep activity take apart-load,with writing activity take apart,load operation. 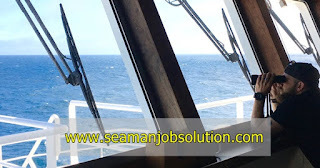 - As safety officer(safety officer), working together with 1st engineer,ensure conditions work safety a on ship and keep all level work,especially related with activities on deck so that all activities as you wish with safety. - As you wish care departement deck,with do inspection the deemed necessary or like instructed by master. - Keep maintenance and care the tools safety and other,and the tools the fire departement. - Examination and chcek CO2 system work together with KKM. - Keep training kadet deck. - Doing task other give by master. Share to help knowledge of seafarers work on another vessel. 0 Response to "Job Descriptions And Responsibility Of Chief Officer / Chief Mate At Ship"